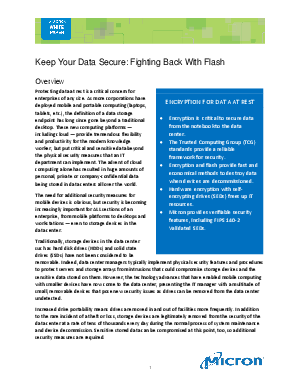 Companies and their IT managers have long recognized inherent risks to stored data in mobile computing, and self-encrypting drives have long been seen as the leading solution to this risk. Proper deployment of SEDs provides verifiable protection of data on a mobile computing system, whether it’s a laptop or a phone or a tablet. But mobile computing is just part of the story. The shift to cloud computing has placed enormous volumes of sensitive data in data centers around the globe, focusing much more attention on enterprise encryption. The IT professionals who manage these data centers realize that SED adoption satisfies regulations and standards compliance, lowers total cost of ownership (TCO), increases IT efficiency, and most importantly, secures data by preventing data breach due to lost or stolen devices. Micron is uniquely positioned to ease adoption with extensive expertise, advice and support. Download this white paper to learn more!